St Catherine Chapel on Hwy 7, near Meeker Park, CO (south of Estes Park), with a view of the southern end of the Rocky Mountain National Park. This photo (with the EXPANDED Moon) is now a postcard for sale at St Catherine's Chapel on the St Malo Retreat area, on Hwy 7 in Allenspark (by Estes Park, CO and Rocky Mountain National Park). Donated the rights to it. Hope it does well! WOW!! looks so much more impressive on the FB site!! the moon just glows there! Wow, I got engaged there once, I was was so romantic at one time. Love the shot, I'm inspired to go back there, thank you. I've been there, a beatiful place. I actually stayed in the hotel right there. Unfortunately I didn't have my interest in photography as I do now. I would love to go back someday. Beautiful picture! Can you say "cover of a calender"? That is what this shot is. A stunning shot. Perfectly lit, ideally framed, layered with consonant textures and colors. I would say the same thing about the seven people who rated it a 4. And someone gave this photo a "2" rating....why? I swear, when I see a photo and then it's got some vote really low for it that is in no way justified. I just wonder "who are these people...and what grudges are they hold"
This picture is pretty incredible. I love it. What an amazing shot, with the moon and everything, bravo! this picture is the best one i have seen so far.you can actually draw a s in the middle of the picture to see how good the composition is. the color of the foto is just perfect. Great photo and great title to match! Great job. You deserve the ribbon finally after so many other great shots that didn't make it. Keep it up. Congratulations on a stunning entry and your first ribbon! Well done! Wow, the lighting is just beautiful! Congrats! Obviously the voters gave this 0.006 too many points, but despite that sheer luck - well done anyway! Its my fault - I went back through them and bumped this one up!! Great shot, well deserved. Absolutely cracking shot - well done. ROFL! You Keeeeeeellllllll me Imag! (C: But we would have tied if it is only .006 too high! Then what!? THANKS FOR ALL THESE AWESOME COMMENTS!!! Very appreciated, for sure! Message edited by author 2004-09-13 12:58:14. Congrats on the ribbon - this is beautiful... I love every aspect of this photo. Someday when I make it to Colorado, I want to visit this place. Wonderful work! Beautiful shot. You really caught the spirit of that location. I do know it, I am from Boulder, currently residing in Atlanta. Congrats on your ribbon. This is just beautiful ! Wonderful light, textures and rich colors/tones ! congrats on your first ribbon. persistence pays off :). Ya finally got that long deserved ribbon!!! Congrats!! Wonderful piece of work...well deserving of the ribbon. Congratulations Tracy - a shoock to realise that this is your first ribbon. Congrats man! Glad to see you finally got a ribbon! Beautiful shot. Congrats on the red ! Glad to see this ribbon. What perfect timing on the lighting! Congrats on your first ribbon! Spectacular shot. I mostly love the light falling on the building. Very well deserved. Message edited by author 2004-09-13 02:13:22. The church that was built on the rocks indeed! Great photo and colors! What a wel -balanced photograph ; 1,2,3 - both ways , plus color , time of day , Instant Fave !!!!!!! Message edited by author 2004-09-13 00:53:15. Hey Tracy, congratulations! Well deserved ribbon and a fine photo! Congrats on your first ribbon, Tracy! Well done! congrats on the ribbon! you and imagineer have waited a long time. Message edited by author 2004-09-13 00:15:30. Congrats on the red ribbon. Congratulations!! I had a feeling this would ribbon. Absolutely gorgeous!! Congratulations on your red. An image that charms the eyes. beautiful shot. I voted on this one 5 minutes before the close of the voting...congrats! Just beautiful. One of my top picks. Beautiful. Certainly very enticing for the reader to come and visit. Nice picture, but the moon doesn't look real, and is distracting. Nice subject and well composed but the image looks over treated with the shadow/hilight filter - giving rise to the familar halo. It's a shame because it looks like an interesting place. Perhaps you were just too late for the sun. A most charming and lovely colored image with great foreground and background. Very good right heavy composition. I love this picture! 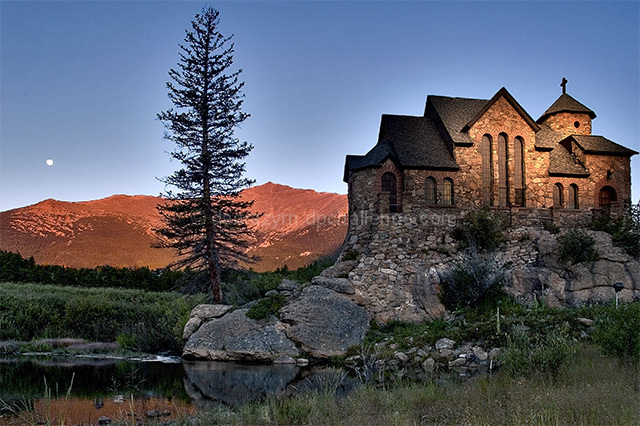 I just got back from Estes Park last week, and got some great shot of this striking Church at St. Malo, but none at this time of day, which makes it even more striking! I love that area so much! You certainly have lots of choices for travel pictures in that area, don't you? Good job! Neat juxtaposition of sunset and moonrise - or vice versey. Love the image. Would it have been possible to dodge the left and right of the building to get more of the lighting effect? Might not be necessary, but could have shown even more detail in the building. Anyway, still love the image. Congratulations. Very cool picture, excellent focus, color and contrast. I'd never think place like this existed in the Rockies. bit tight on the right but very good. a magical atmospheric photograph. makes me want to go there. One of my top 3 and probably the best. Excellent timing with your lighting. Great composition. I wish I could give it higher than a 10! I really like it, it's definately a wall hanger :) Great composition, and I particularly like the sliver of sunlight shining on the building. Very nice use of the sunlight. Good placement of the subject. Good use of available light! A great one.... 10 from me. Makes me wonder - if I saw it, could I capture it? A beautiful shot. Great timing with the sunlight and the moon is a great bonus. Absolutely amazing! From the color to the lighting to the moon this is all together a wonderful shot! Love the moon on the left side and how you framed the picture. Excellent Job. What a stunner ! A ribbon winner for sure ! The colors, shadowing, and highlights are wonderful ! Where is this??? it's great! the dodging is a little evident. however, it really helps even so. Proudly hosted by Sargasso Networks. Current Server Time: 04/21/2019 12:15:12 PM EDT.